Wednesday. My day off….and it is. I’m being strict with myself and my employers and today is officially a day for me (well OK, a little gentle housework and laundry did sneak into the equation – but not so much as to disturb the general equilibrium!). Whilst I had visions of sewing along happily all morning, what I actually did was the basting for the Sea Glass quilt. My absolutely least favourite part of quilting, but hey ho, needs must. Anyway it’s done – and backed with a lovely turquoise checked pattern from Fresh Palette by Carrie Nelson. I didn’t have quite enough, so the sides are augmented with some turquoisy solids. Next up some FMQ – pebbles I think – that would fit pretty well with the whole theme. (Sorry for the rather dark photos – we are back into the depths of winter with snow and absolutely no sun). 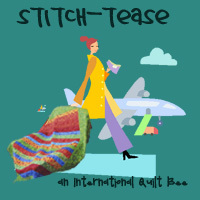 Happy knitting and sewing out there ladies…and I’ll be back before long! This entry was posted on Wednesday, March 27th, 2013 at 2:05 pm	and is filed under Quilting. You can follow any responses to this entry through the RSS 2.0 feed. Both comments and pings are currently closed. Yaaaaay I saw you had won these super duper threads! What a treat! Love your sea glass quilt & backing and I think pebbling look fantastic (pebbles – sea – perfect!). Even without the maritime link, I think pebbles might be my favourite quilt design. I have heard pebbling eats thread so maybe it’s just as well you won the Aurifil! I was dead chuffed when i saw you won – yay! Glad to hear that you are sticking to your guns and are taking the day for yourself. Quilt is looking good and congratulations on the win – I’m sure you are going to make good use of it. Helen, that sea glass quilt is absolutely amazing. So beautiful. And congrats on the threads! Interwebs prizes are the best! Yay! For sewing and the win. So pleased you got those threads. What a lovely win :). We’ve got the same grey light here too. I see you’ve actually sewn-basted your quilt. 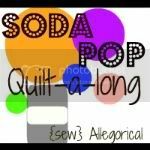 I might try that next time – basting is also my least enjoyed part of the quilting process – I’ve tried lots of methods – even emptying a can of spray baste on to a quilt!!! It did almost work – one crease on the back of a quilt which is now sitting on a friend’s loveseat – and she didn’t mind at all! Well done for basting your sea glass quilt. It looks great, love the baking. And hurrah! for winning Lynne’s giveaway. When I saw you’d won I was so happy for you. I would, of course, have loved to win too but never mind. Enjoy sewing with it! Wow. Well done on the week. So excited that your sew euro-bee-an quilt is making progress. Lovely win – don’t spend to much time looking out for the UPs van! Well done for keeping your ‘you’ day,a nd enjoy the threads! just catching up with you. I hope you had a wonderful Easter. Congratulations on the win.